In Odense, during the spring, a new, exciting cycling project will start called “Cycling without age”, that gives the elderly the opportunity for coming together, getting new experiences and wind in the hair in the company of committed volunteers – and there is loads of cycling! The goal of the project is very simple: through cycling we want to build relationships between generations, get more of the elderly out into the fresh air and being proactive in enhancing their quality of life. 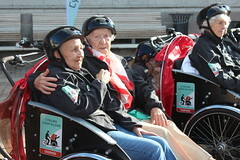 “Cycling without age” is built on the simple idea of getting the elderly out to socialise with others on a bicycle ride. 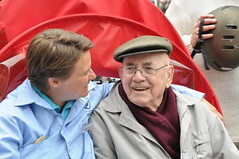 The rides are planned on the elderly’s own terms, so they can experience Odense up close. The project is designed to strengthen community, social togetherness and cooperation with volunteers, and it is a part of the nationwide movement Cycling without Age that has spread over the whole country. In Odense, the project was launched in May, and a lot of kilometres have been cycled on the new rickshaw bicycles. We have invested in 15 bicycles, which are located at 15 different retirement homes. We did this to make a difference for as many as possible. Cycling without Age is exciting as it attracts many of the elderly to go out and cycle. The project aims to reach the elderly at both retirement homes and those that receive home help – and it also aims to reach out to other groups that would be benefitted by getting out and getting the wind in their hair! Cycling without Age is a different type of project because it appeals to volunteers of all ages. That is why in Odense we have formed a partnership with Red Cross Odense, an association that can reach a broad group of volunteers. The Red Cross’ main goal is combating loneliness, which makes the project even better and means that we can reach the most isolated of the elderly in Odense. In addition, the project has great potential for creating a more active citizenship amongst dependants and the inhabitants of the neighbourhood, who are thought of as volunteers for the project. Therefore, we can push the boundaries of how many volunteers, dependants and elderly we can reach over the coming years as the project is activated in Odense Municipality! Cycling without Age is a part of Odense Municipality’s new mobility plan for 2014 and 2015. The goal is to get 250 of the elderly out cycling each year. The mobility plan is an ambitious one that works to increase the mobility of the inhabitants of Odense by focusing on smart mobility, less congestion, business, children, the elderly and those with special needs. 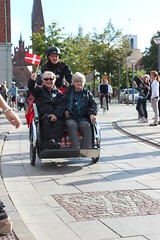 In Odense it has been the collaboration between the City and Culture Department and the Association for the Elderly and Handicapped that has made Cycling without Age a reality.